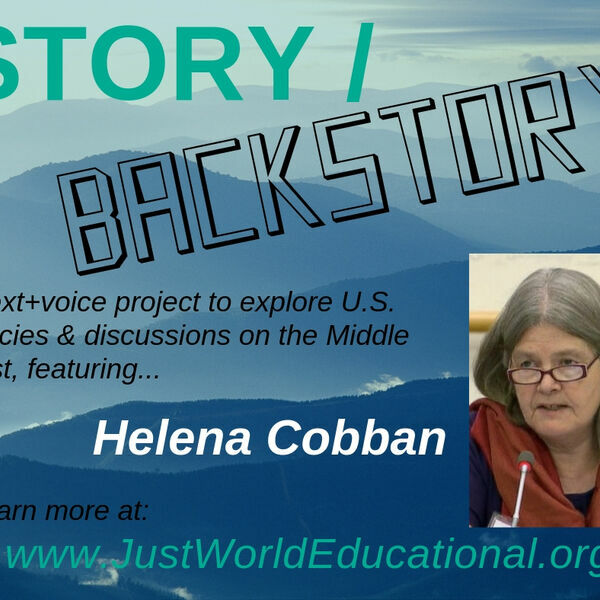 Helena Cobban:0:08Today on Just World Podcasts Gaza As Crucible. Hi I'm Helena Cobban, the president of Just World Educational. This week's podcast is the fourth in our series Story-backstory which explores Washington's current policies in the Middle East and the Middle East itself in a broader historical perspective. Each week in this project, I am writing an opinion column that gets published on the Wednesday, generally on the great Mondoweiss news site. Then a few days later, I follow that up with this expanded audio version that starts off with me simply reading the column. Then, after the reading I'll provide yet more backstory on that same topic. This week we have another special guest on the second half of the show. I've been in London this week and I had the chance to record a short conversation about Gaza's Great March of Return with the British Palestinian academic and activist Dr. Azzam Tamimi. Tamimi has authored a number of books including the fascinating 2007 title "Hamas: A History from Within." Helena Cobban:1:27And he's a director of the influential London-based Arabic language satellite TV channel Al-Hiwar. If you've already read my Mondoweiss column and want to skip my reading of it here you can just fast forward by about 10 minutes and listen to the 16 minutes we have of my conversation with Dr. Tamimi. Helena Cobban:1:48As always, please note that all the opinions and judgments I express in this project are my own personal ones. They do not represent the views of Just World Educational or any other organization. So now: "Gaza, The Crucible." Helena Cobban:2:05LONDON March 12th 2019. For 50 weeks now, the Gaza Strip has seen thousands of residents taking part every Friday in a creative mass protest called the Great March of Return. Might this well organized non-violent action mark a new trend in Palestinian politics? If it does it would not be the first time that the densely populated Gaza has acted as a crucible for the emergence of a new political force in Palestinian society. Helena Cobban:2:39The Great March has two main demands to lift Israel's brutal 13-year siege of Gaza and to implement the Palestinians' Right of Return. It has been sustained for this long despite the brutal response it has received from IDF fighters stationed just across the armistice line with Israel. Between March 30th and December 31st of last year, those IDF soldiers killed 183 protest participants with live fire and six protesters in other ways. They also injured more than 7,500, some extremely seriously, with their bullets and their shrapnel. Helena Cobban:3:26Recently, in late February, a commission of inquiry convened by the UN Human Rights Council reported that it had received information about thousands of cases from last year let actively investigated 489 of them including the 189 killings. In all but two of these cases, the commission found reasonable grounds to believe that the use of live ammunition by Israeli security forces against demonstrators was unlawful. Under international law, live fire against protesters is permissible only if the person targeted is engaged directly in hostilities or if he or she presents an imminent threat to life or serious injury of the security forces. This large collection of individual crimes may also, the commission found, constitute crimes against humanity under international law and it recommended that Israel's actions be referred to the International Criminal Court. Over the coming months, we will see whether that happens. Helena Cobban:4:40Meantime, I am fascinated by the bravery and dedication of the massive numbers of Gaza Palestinians who for nearly a year have returned week after week to these non-violent citizen protests. Is something new going on here? It may well be that we should note that there are other places in occupied Palestine where weekly mass protests have been sustained for a very much longer time in Bil'in for example or Nabi Saleh, both of them in the West Bank. But the Great March protests in Gaza are different both because of their eye-popping scale and because of Gaza's historic role as a crucible for the emergence of new political forces in Palestinian society. Back in the 1950s when the Palestinian refugees Yasser Arafat, Salah Khalaf (Abu Iyad) and Khalil Al-Wazir (Abu Jihad) were putting together the activist networks that later became Fatah, they did so primarily in Gaza. Thirty years later in 1987, when Sheikh Ahmed Yassin and his colleagues were launching Hamas, they likewise, did so in the first instance from Gaza. Helena Cobban:5:59Why has Gaza played this role? For a number of reasons, but primarily I think because it is the area inside historic Palestine that has the largest concentration of people who are refugees from the lands that became Israel in 1948 and because the return of the refugees has always been a key driver of the Nationalist Movement. Some 75% of Gaza's two million people are refugees from 1948. Helena Cobban:6:32Forty years ago, when I was researching the book I wrote on the history of Fatah and the PLO, Arafat, Abu Iyad and other founders of Fatah talked a lot about the intensely political atmosphere in Gaza back in the 1950s. Palestinian society was struggling to deal with the national collapse that the Haganah, IDF, had inflicted on them in 1948. Return became the strongest rallying cry both for Fatah, which tries to avoid any ideological entanglements apart from Palestinian nationalism and for other more avowedly leftist organizations in the Strip. In the 1950s, the Strip was controlled by Egypt with some difficulty Fatah early organizers were able to come and go between Gaza and Cairo and also from Cairo to other Arab capitals. Helena Cobban:7:30Already in that decade, many Palestinian refugees from Gaza and elsewhere were getting good jobs in the Gulf. Their education level was much higher than that of the herders and traders who made up the sparse population of the Gulf countries. So, they ended up creating and running the whole administrative apparatus of places like Saudi Arabia, Kuwait or Qatar. The latter two remained under British control until 1970. But they always needed administrators teachers doctors and engineers. Palestinians exiled from their homes in 1947 or 1948 took on most of those jobs. Gaza and Kuwait became the two key organizing nodes for Fatah, and so it remained until 1990. In the early 1980s, I was doing intensive interviewing with Khaled Al-Hassan, Abu Sayeed, one of the Fatah founders, who had headed Kuwait City Administration for some years. He took me to a Fatah PLO fundraiser at a big hotel there, which could have competed in glitz and enthusiasm with any big time Jewish community fundraiser in L.A. or New York. Helena Cobban:9:15Many Gazans remained loyal to Fateh or the leftist Palestinian groups they had long supported. But in December 1987, Gaza also saw the birth of Hamas, which is an acronym for the Islamic Resistance Movement. Hamas's founder was Ahmed Yassin, a Gaza-based refugee from 1948, who was also a quadriplegic. He and his colleagues launched Hamas, just a few days after the grassroots activists of Fatah and the other secular nationalist groups in Gaza and the West Bank, had launched the first Intifada. Helena Cobban:11:16It has built strong networks of supporters in the West Bank and among all the communities of exiled Palestinians. In the mid aughts, Hamas made some key adjustments to its previously hardline program. It ended its use of suicide bombings against Israeli targets. It amended its previous call for the destruction of the Israeli state by saying that on the path to that, it would be prepared to have to accept a lengthy Hudna or truce during which a Palestinian state could exist alongside Israel. And on the basis of its support for the Hudna, it agreed to suggestions from Israel and Washington that it participate in the Palestinian Legislative Election of 2006. It then did participate peacefully and fairly in that election and it won. The Israelis and Americans, who had been confidently predicting a Fatah victory, were dumbfounded and furious. Ever since then both governments have worked super hard to punish Hamas and its presumed home-base in Gaza, very strongly indeed. Helena Cobban:12:35Nowadays Hamas's base of support is very much wider than just Gaza. But for Hamas, as for Fatah Gaza was its birthplace and for a very specific set of reasons. So now for the past year, Gaza has been the scene of these amazing extremely courageous mass demonstrations every single Friday and on at some other key days as well. Helena Cobban:13:02Last year, the organisers of the Great March decided to launch it on March 30th, a date that for Palestinians everywhere is Land Day. A date to reaffirm their attachment to the actual soil of their homeland. This year, March 30th will also see the first anniversary of the Great March of Return. This movement is backed by Hamas, Fateh and all the political and social organizations in Gaza. Will it go down in Palestinian history as the third great political movement to be born in Gaza? Helena Cobban:13:46So that was the column. And now, let me urge you to visit our website which is www.justworldeducational.org. There, you can learn a lot more about Just World Educational, you can sample some of the great educational resources we make available there, and you will find links to our social media accounts on Facebook and Twitter. You'll also find a handy tab on the website that tells you how you can donate to support our timely educational work. So now the conversation that Dr. Azzam Tamimi and I had on the Great March of Return. I am here in London with Dr. Azzam Tamimi, who is a distinguished author who has written widely about Hamas and its history and about Palestinian affairs. Azzam, it's good to have you with us. Azzam Altamimi:14:37Thank you very much. You're most welcome. Helena Cobban:14:39So, I wanted to talk with you about the Great March of Return, because we have the first anniversary coming up March 30th and from your perspective I know you travel a lot around the world but you're based here in London, what do you see that's new and interesting in this Great March of Return that has been going on for nearly one year now. Azzam Altamimi:15:04I think the most significant thing about these marches is that they come at a time when the Trump administration talks about its own peace plan, the so-called Deal of the Century. And I saw that those marches were the direct response by the people of Gaza to what Trump and his son-in-law seem to plan for Gaza and the rest of Palestine. But also, it is a response to the siege imposed on this Strip, a siege in which three parties participate: the Israelis, the Egyptians and the Palestinian Authority. And I think the people of Gaza went out to say enough is enough. We cannot tolerate any more of this. They wanted to draw the attention of the world to their plight, because so much has happened over the past decade that the Palestinian issue seemed to disappear from the political scene somehow. That the media, the international media in particular, was paying more attention to other issues maybe rightly at times. And the Palestinians felt that their plight was not being felt by the world. Helena Cobban:16:47So the siege of Gaza has been pursued continuously really since 2006 since Hamas won the election. Throughout the whole of the occupied territories in an attempt as I see it to punish Hamas and to punish the people who they think voted for Hamas and to turn the people against Hamas. Clearly that has not succeeded. So, one of the goals of the Great March of Return is lifting the siege. And the other is implementation of the Right of Return. Now these are two very different scale of of demands for any social movement. Helena Cobban:17:31What do you see as the relationship between these two demands? Azzam Altamimi:17:37Demanding a lifting of the siege is a practical demand and it is supposed to be an immediate requirement. Simply because the people are finding it very difficult to go on the way things are. The demand of return to the homes of the Palestinians from which their ancestors or very few of them who remain alive were banished in 1948 carries more symbolism than a practical request. I think the people of Gaza dream of going home dream of seeing Palestine liberated from Zionism, but they know that under the present circumstances this is not going to happen. But I think the symbolism of it is to tell the world that we Palestinians have not forgotten and that we have not given up on our dream. That sooner or later something will happen and it will be accomplished. It is also a response to the Trump administration's Deal of the Century that you cannot buy us. You cannot silence us with some promised carrots here and there. Our ambition is much greater and nothing will make us give up on it. Helena Cobban:19:13Well, of course we haven't seen the Deal of the Century yet. I don't think they've dared to unveil it and now they're saying they won't do that until after the Israeli elections and who knows how long it will be postponed. Helena Cobban:19:29But I guess they were saying that one of the aspects of it would be that there would be a lot of economic investment in Gaza which I guess is what you're saying give them carrots in the hope that they forget their national goals of national liberation. One of the things that's been happening in the Great March, which also happens in the Israeli prisons, is that Palestinian activists from all the different factions whether we're talking about Fatah or Hamas or Islamic Jihad or the Popular Front or other, well, those are the main ones maybe, have been working together and cooperating. Can we see that this might lead to a broader cooperation and to the success of the reconciliation project specifically between Hamas and Fatah at the national level? Azzam Altamimi:20:28I personally don't believe that reconciliation between that Hamas is possible at any time so long as each of the two parties adhere to their positions. It's impossible for them to be reconciled. Reconciliation here means that they meet halfway or one of them convinces the other of shifting to his own position and this is not going to happen. This is unlikely to happen. Azzam Altamimi:20:58The talks that began in 2011 in Cairo and have been going on since then in so many places have always met a formidable obstacle and that is the commitments by the Palestinian Authority, which is the product of Oslo, to the Israelis in terms of security cooperation. How can you consult reconcile one party, which believes that the Zionist occupation is illegitimate and that eventually Palestine will be liberated, with a party that has conceded two thirds of Palestine to the Zionists and entered into security collaboration with them. It's just impossible, it can never work. And I think it would be better to consider the return marches separately as a collective Palestinian effort to draw the attention of the world to the plight of the Palestinians in Gaza. Everybody in Gaza. has a stake in it. Azzam Altamimi:22:12Everybody in Gaza has an interest in the success of this project. And this way everybody participates, whether they are factions or civil societies institutions. And Hamas which is the governing authority also has an interest in seeing the success of this project. And that's why it facilitates it and it coordinates with whoever is involved in in managing the marches. Helena Cobban:22:41I have been fascinated to see the fact that although Hamas still has a military presence in Gaza and has never been forced to give that up, there has been this very clear demarcation and this is actually also noted in the UN report, it says there is a separation and demarcation between the defensive military activities and capabilities that Hamas retains in Gaza, and then what people are doing with the non-violent Great March of Return. Do you think there's been extensive discussion of that and I'm also really interested in where they got the idea for creative mass nonviolence? Because obviously in the West most people think, you know, Hamas is just crazy and terrorist and violent and militaristic and doesn't understand anything else. Azzam Altamimi:23:39Well, the world seems to forget that the Palestinians have been the victims of an invasion, have been the victims of foreign occupation. And therefore, they are entitled to use whatever means of resistance available to them. Azzam Altamimi:23:57Yet, generally the Palestinians preferred non-violence means. We saw this in the First intifada that erupted in December of 1987. For many months, it continued to be a form of civil disobedience, strikes, marches, maybe using stones. But then, because of the Israeli disproportionate response, some Palestinians started resorting to violence to counter violence. Azzam Altamimi:24:33And this took forms. (It) started with the knives, moved on to some primitive rifles, then some more sophisticated ones, then the martyrdom operations then the rockets. Now, as things stand today in Gaza, there is generally an unofficial truce between Hamas and Israel. Helena Cobban:24:59...which has not been negotiated, but it's sort of more or less stuck in place since 2014 which was a long time actually. Azzam Altamimi:25:08True. But it is in the interest of both sides not to escalate into military violence. Both sides understand that military violence can be disastrous on both sides. And therefore, whatever Hamas has of military power, is really more defensive than offensive. And when I used to meet Hamas leaders in Gaza when I used to go to Gaza before the coup in Egypt in 2013, we used to discuss this and I discussed it with Haniya himself. So they know, they understand, that the role of the military in Gaza is defensive not offensive, because the balance of power is definitely not in their favor. Yet, the calls for nonviolence resistance has always been among the Palestinians. Azzam Altamimi:26:41Exactly. it was then that the Israelis went to Sheikh Ahmed Yassin in prison and asked him to do something and he offered them a truce. That was the first idea of the long-term Hudna or long-term truce about which I have a chapter, a whole chapter, in my book. And therefore, it is not a new invention in the Palestinian struggle. It's always has always been there. But what is really new about it, is the circumstances in which Gaza happens to be. Gaza is under siege. Gaza is suffering. At the same time Gaza is resisting those pressures. Azzam Altamimi:27:23And as you rightly said, the idea of the siege was to turn the people of Gaza against Hamas. That hasn't worked. People don't have an appetite for this, because they know Hamas is not the problem. The problem is Israel and the Palestinian Authority and to some extent the Egyptian authority especially under Sisi. This is really what is new about this mass show of non-violent resistance. Helena Cobban:27:56So, what can people outside, who want to support Palestinian rights and to to support the Great March of Return. What can we do? Azzam Altamimi:28:07I think our main problem outside Palestine is with the Western democracies, because these Western democracies are the ones that support Israel almost unconditionally. I'm referring here the United States of America the United Kingdom and France to Germany and citizens of those countries have a right to talk to their MPs, to their representatives, to their congressmen and senators and say to them we expect you as an elected member of this institution, which represents the people. to side by justice. And therefore, we need to build pressure to bear on the decision-makers whether they are in parliaments or elsewhere. Helena Cobban:28:59That's a great point. So, as of now coming up to the first anniversary of the Great March, can you see that it has had some successes? Or do you think it will continue? What kind of outlook do you see? Azzam Altamimi:29:15Now these marches were started by the people of Gaza. Nobody told them to do it or provoked them to do it. And therefore, if they feel the need for them to continue, they will continue. We cannot tell them continue or do not continue. It depends on what they can bear, because there is a price. The people the people inside Gaza pay a price for this. (Terrible price). An increasing number of people are losing limbs, are losing loved ones. Therefore, it's not easy. But has this movement been successful? I'd say yes, it has been very successful in that it has brought back the Palestinian issue to the fore, because since the Arab Spring the Palestinian issue seemed to take a back-seat. Azzam Altamimi:30:05Whether in the international media or on the minds of politicians around the world and the people of Gaza needed to cry out and tell the world we are here. Look at us. Look at what's happening to us. Helena Cobban:30:21Well, thank you very much. Dr Azzam Tamimi. I look forward to talking to you again. Azzam Altamimi:30:26Thank you very much. It is a pleasure.